NEW! Peruse Manly Council Tramway Feasibility Working Group Agendas, Minutes and Technical Documents. The proposal for re-establishing a tramway system in the Manly Central Business District (CBD) was inspired by the initial Manly 2015 draft concept drawings produced by the Architects Choi Ropiha showing trams on a central reservation on Belgrave Street to link Manly to Dee Why. View of the Ocean Beach end of the Corso in 1913 showing electric tram heading to Manly Wharf. The proposal for a new Manly to Dee Why tram line motivated a re-investigation by Manly Council's Sustainable Transport Committee of the original Manly tramway system that operated between February 1903 and September 1939.
the line to the Spit was first operated to terminate via a loop around the centre of Manly. provide a highly visible cue in the form of the tramway track that acts as a "magnet" to draw people to this transport service. Raglan Street (optionally Carlton Street) back to Belgrave Street. The stops are placed to serve the important and popular destinations around the Manly CBD, but carefully located to always allow cars to pass stopped trams (in the process of loading and unloading passengers). Sections of South and North Steyne and East Esplanade are critical in this regard, due to the narrow road width. 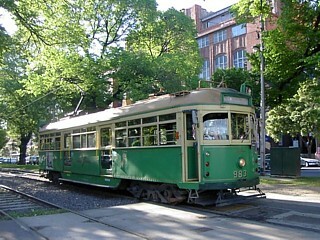 To maximise tourist potential, and reduce system establishment costs, it is proposed to use vintage corridor trams. Corridor trams are considered safer than the more open "toastrack" type trams previously used on the Manly system prior to 1939. 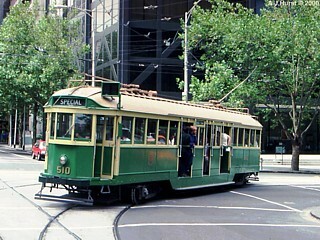 Depending on rolling stock availability and time frame to commencement of operations, preferred tram types would include Sydney "R" or second preference "R1" types or Melbourne "W6" types. The advantage of the "R" and "W6" types is they have a lowered or "drop centre" design which are slightly easier for less mobile passengers to board. There are currently approximately 150 W-class vintage trams in storage in Melbourne, so these would be the most practical to obtain to commence operations in the short to medium term. The construction of the line to permit operation of vintage trams would not preclude rollingstock being updated to more modern stock at any future point. The length of the loop and the stops proposed above would result in trams taking about 12-14 minutes to complete the loop stopping at all stops. The corridor trams proposed above can hold around 50 passengers each. The frequency of service would be either every 10 minutes (requiring two trams) or every 5 minutes (requiring three trams). These numbers are just to maintain service frequency and do not take into account any additional peak patronage requirements (to meet any passenger demand beyond one full car load) or operationally spare trams (to allow for maintenance and repairs). Where is the project currently up to? 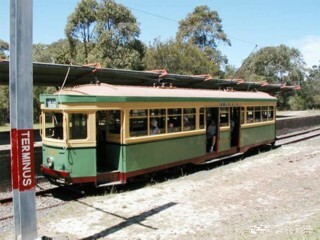 Determining and negotiating source of suitable vintage tramcars and timeframe to their service availability. Preparation of detailed track layout plans (including power supply arrangements) ready for construction. Like to help or get involved in the Manly CBD Tramway Proposal, or just be kept up to date (or meet people like you that do) ?